If you were asked to identify the number one mouth problem affecting dental health, what would you name? Toothaches? Poor hygiene? Jaw joint issues? Believe it or not, the top issue among 15,000 respondents in a recent American Dental Association (ADA) survey was dry mouth. A full one-third of the respondents had experienced chronic lack of normal saliva flow; difficulty biting and tooth pain, took second and third place, respectively. We’ve all experienced the discomfort of temporary dry mouth when we first wake up in the morning or after eating certain foods. But chronic dry mouth is much more serious with long-term effects on a person’s teeth and gum health. This is because among its other important properties, saliva helps neutralize enamel-softening mouth acid and restores minerals to enamel after acid contact. Without sufficient saliva flow you’re much more susceptible to dental disease. While there are several causes for dry mouth, perhaps the most common is as a side effect to at least five hundred known medications. 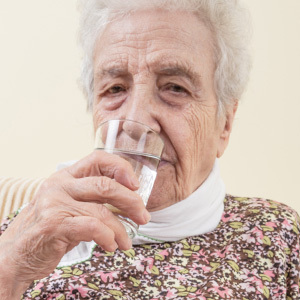 Because older people tend to take more medications than other age groups, dry mouth is an acute problem among people over 60 (a major factor for why dry mouth took the survey’s top health problem spot). You can help ease dry mouth from medications by first asking your doctor about switching to alternative medications that don’t affect saliva production. If not, be sure to drink more water during the day and especially when you take your oral medication (a few sips before and after). You can help your dry mouth symptoms from any cause by drinking more water, limiting your consumption of alcohol or caffeine, and avoiding tobacco products. You can also use substances that stimulate saliva flow—a common one is xylitol, an alcohol-based sugar that’s used as a sweetener in certain gums and candies. Not only does xylitol boost saliva flow it also inhibits the growth of bacteria and thus decreases your risk of disease. And speaking of reducing bacteria and their effects, don’t neglect daily brushing and flossing. These habits, along with regular dental cleanings and checkups, will benefit you just as much as your efforts to reduce dry mouth in avoiding dental disease. If you would like more information on treating common problems with teeth and gums, please contact us or schedule an appointment for a consultation.